I don’t think of myself as much of an artist, my main form of creativity is writing followed closely by music. I am visually impaired (almost completely blind in my left eye, and need glasses for the right eye). I can’t draw because I can’t make a straight line. I see in 2-D so my perspective is not the same as most people’s. This is the way I have always been, so it does not get in the way of my life at all. Well, I should not drive at night, but I don’t like driving anyway so that is not a big deal. Because of being unable to draw I never let myself get into painting even thought I really wanted to, until last year when I took one of those byob painting classes (I went to dip n’ dab in atlanta). I figured since it was going to be mostly tipsy people who were just doing it for a laugh and since all the supplies were provided there was no harm in it, and minimal cost. I had fun. Now I am painting from time to time and I enjoy it. I like the way my paintings look, and I don’t judge them nearly as much as I thought I would. I paint some on canvas but the last few weeks I have been painting on terra cotta pots. I had done that before, but more like paint then a single pretty color or use a stencil. The few I did try to paint more on I was to nervous and they did not come out well. The pots appeal to my rather practical nature about these sorts of things. They are useful, I might have bought them anyway, the paint is very cheap, so aside for a little time I am not ‘wasting’ anything. Fun and practical. I spray the pots with Thompson’s water-sealer first, give them at least a day to dry and then paint with the acrylic paints in the little bottle that you get from any arts and crafts store. I wait for a sale to buy new ones, as cheap as $.77 a bottle. This weekend there is going to be an art hunt put on by Atlanta Fringe Festival. It is a free event in Grant park. You look around for art and anything you find you keep. The nice people at Fringe are doing all the hiding and planning, but for the art they need donations. While I would not sell my art, I think a free pot regardless of what is painted on it should make someone happy, so I submitted it (and a short story, printed out). I painted a bunny for spring/easter/ostara. I think it is cute. It makes me happy that someone, a stranger, will find this and that it might bring them happiness. Or even just usefulness. I made this one a few days earlier for myself. 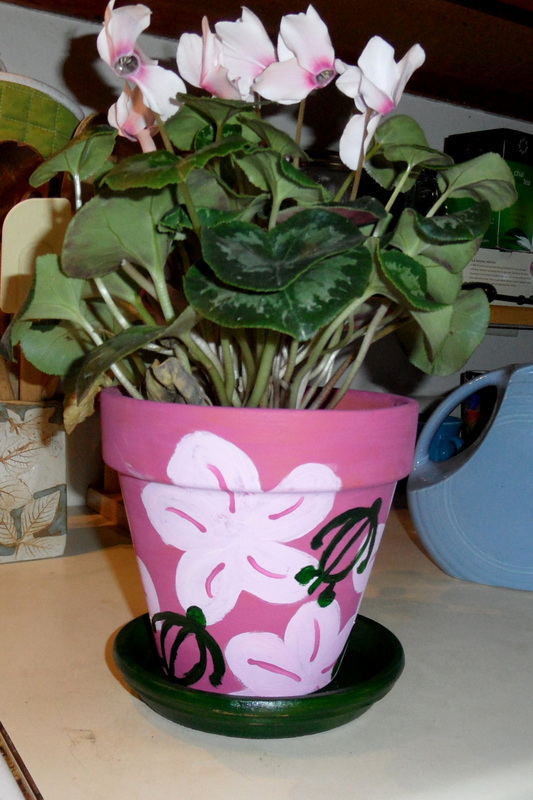 It is based on a Hawaiian print I like, but in the colors of the cyclamen I put in it. I am not happy with how the turtles look, but I can’t exactly tell you why. They just don’t look right. But over all I think it is lovely and the colors match well, so yay! I plan to make a few more for the garden. They will add a little extra color and art, making the garden a bit more fun. They also make great gifts.